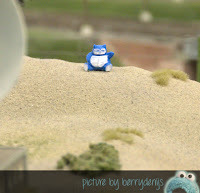 Berry had to go to MiniWorld Rotterdam in December and guess who tagged along… heehee… yes! ME! That no surprise, right? 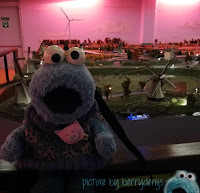 She had to go there for her blog (Dutch readers can check it out here: Nieuw in MiniWorld Rotterdam: Belasting & Douane Museum). And me? Well me always tag along with me human bestie. 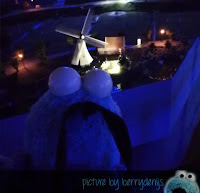 Also MiniWorld Rotterdam was so great, me wanted to write me own blog about it. So come along with me, because me gonna tell you all about it! 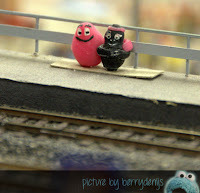 We went to Rotterdam by train. It a great way to travel. Me always get to sit on the little window table. Me call it the best seat of the whole train! Why? Well, me can see everything. And it had been snowing that week, so the world outside looked like a frozen fairytale. 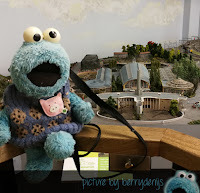 The best part of travelling by train to Rotterdam from Utrecht (and back), is that you cross over Diergaarde Blijdorp (also known as Rotterdam Zoo). 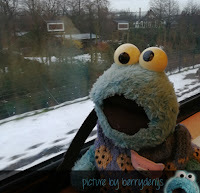 So even though me no went to the zoo that day, me still got to see some of me animal friends from the train! That was sooo awesome! All the animals looked so small. Me loved it. 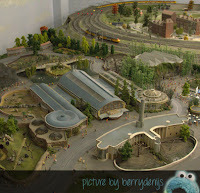 It only a short walk from the trainstation to MiniWorld Rotterdam, so it took only 5 minutes or so to get there. Once inside me spotted some awards that they had won. 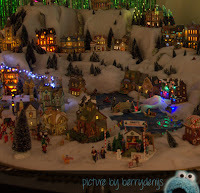 And there was a Winter Wonderland Village with trains and mountains in the lobby too! It was beautiful. Also me liked the shop with all the very Dutch souvenirs. 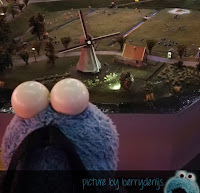 Berry was invited for the big revealing of the Dutch Belasting & Douane Museum (The Taxes & Customs Museum), so we both were really excited to see MiniWorld Rotterdam for the first time! Well, you know me not the biggest monster in the world. 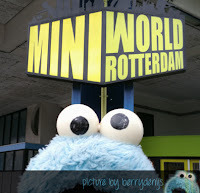 But when me entered MiniWorld Rotterdam me felt like a GIANT! Everything was soooo tiny and that made it so much fun! 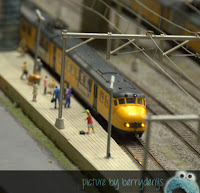 There were loads of trains riding through the tiny version of Rotterdam. And the harbour was there with gorgeous ships. And o, Ahoy was there, and ofcourse windmills, theatres, churches, museums and De Kuip where Feyenoord plays. And Het Kasteel, home of Sparta. It was amazing. There was so much to see! 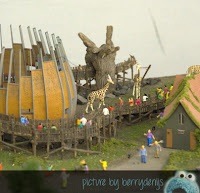 And… o boy o boy, there was even a tiny version of Blijdorp! It was like looking from the train window again. Me loved it! Also fun was that there was a day and a night time in Little Rotterdam. Every 24 minutes it was dawn, day, dusk, night and dawn again. That was so cool, because the sun really sets and during the night all these little lights are on. It was truly beautiful! O and you know what was also fun? All the little jokes the makers of Little Rotterdam had put into the displays. 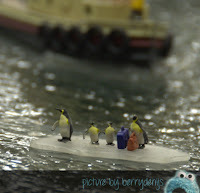 Like the funny penguins on a piece of ice floating in the harbour… with their suitcases! O and the Pokémon who were scattered around everywhere. Me even saw Elsa and Olaf waiting for the train at one of the stations. 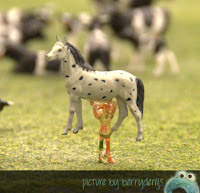 Me also loved little Pipi Longstocking with her horse. Ofcourse she had lifted him above her head! 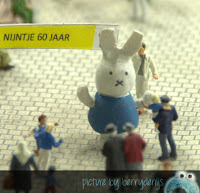 Even Nijntje (Miffy) was there in the city. 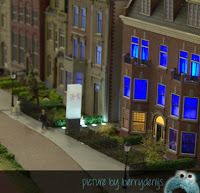 Me can really recommend you to visit MiniWorld Rotterdam when you are in the neighbourhood. It really is sooo much fun. Me hope to go there again sometime, because me certain me no have seen everything yet!